Some may remember the ending of a famous song from many years ago that repeated insistently that every picture tells a story. I am always impressed and excited looking at photos of nature, science and aviation and the distinct story that some images tell. I realised recently though that my interpretation of every photograph was incorrect. I have never been a good photographer: I do not have Karen’s artistic eye that captures details of extraordinary beauty with the same quiet confidence with which she sews beautiful patterns from improvised materials. Nor do I have Fyodor’s technical knowledge whose fingers, now on their fourth space flight, handle the complex professional cameras with confidence, changing parameters almost without looking. I prefer to create memories – linked to the emotion of seeing something – rather than to attempt to improve an image through a lens. Until now I had not realised that the most interesting story is behind the camera: the most intriguing story is the lesser-known one, the cameraman’s. I want to tell you the story behind two of my recent photos: the Aurora Borealis with the major cities, and the missile trail just a few minutes before a suborbital flight . Mike arrived on the station just four days ago, and he already has a personal routine that creates a feeling of comfort, it allows him to counteract the stress of life onboard that is completely different from any experience he has lived so far, despite his long career in the Air Force. It is Saturday, it is still early, but Mike has already been up for a few hours and he is almost done with his daily exercise routine. When I enter Node3 I see him smiling, and I answer with my own smile: we are in orbit, and every day is the best day we could ever imagine! I realise that the module is rather dark and I take advantage of a break in Mike’s exercise routine to fly to Cupola. The windows are closed but it is night outside and it would not make any difference if they were open. I see from a computer monitor that we are going to cross the coast of North America and that our route follows the border between the United States and Canada. The terminator is nearby and I decide to manually open the windows: just like Pavel, I will never get used to the indescribable beauty of an orbital sunrise, and even though I have already seen hundreds of them, I decide to stay in the Cupola, observing the constellation of human lights in the dark that remind me of the presence of humankind on the planet beneath me . Turning my body towards the north, the pale blue-green glow of the Aurora Borealis stops me in my tracks, literally, and I decided that it is worth sharing this show with a friend. I call Mike, who has finished training on ARED and is getting ready for a session on our treadmill, T2. I ask him to come to the Cupola and switch off the lights in Node3 behind him. I turn on a modified flashlight with a red lens to not disrupt our night vision and guide Mike towards the north-facing window. His eyes take a moment to adjust to the sudden darkness. Then I glimpse his smiling face as he greets this fantastic view, a feeling of astonishment I can identify with very well as I will never be immune to it. There are always cameras stored in the Cupola and I take one with a 50mm lens with which I have had the most success taking pictures at night. In the semi-darkness , aided only by the dim light coming through the seven windows, I clumsily try to programme the camera to capture at least a small piece of the ethereal show. Just one picture is enough. The rest of the spectacle will remain in my memory for as long as I have one . One of the several tasks of an astronaut on the International Space Station is known by the acronym CEO or Crew Earth Observation. A team of researchers on ground studies the orbits of the Station and selects objectives to photograph, indicating the time of their passage, the coordinates, the type of photo you need to provide and as much information as possible to find the target. These range from easily identifiable cities to impact craters that are absolutely indistinguishable from the background – all at roughly 400km distance from us. This task is voluntary, but the challenge of finding the targets is a pleasure. Finding a particularly difficult target gives me a satisfaction that must be similar to a passionate collector purchasing a missing piece to a collection. My crew has a daily routine and Expedition 36 has far exceeded all previous photo targets snapped and sent to Earth. I am in Cupola again and I am setting-up a camera on a window overlooking the north. The Station is operating under working hours so all the lights are on. 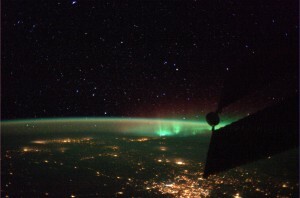 My next Crew Earth Observation target is the Aurora Borealis. To avoid reflections from the Station’s lights I build a tent to obscure the area around the camera. I have already entered all required parameters in the camera, including the estimated time of the aurora. With a little luck I should be able to photograph the sequence even without being physically present behind the camera: at that moment I will be engaged in another activity. Sunset is fast approaching. The gold and orange light that reflects off the solar panels attract my attention and I cannot look away until my eyes focus on an image that is foreign to nature: smoke emerges straight and clear on the horizon, accentuated by the last rays of the Sun. Nature does not like straight lines, and this inconsistency has guided my vision. I am looking at a launch of something, I do not know what and I do not know where, but it is definitely a launch. 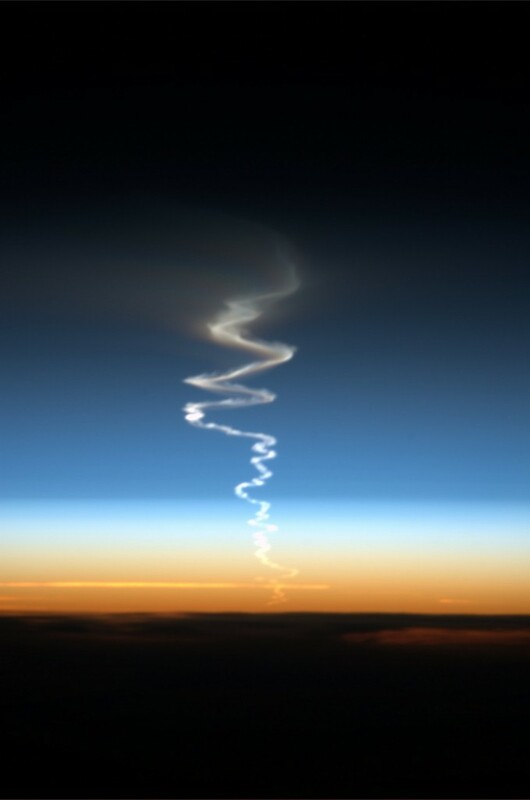 I do not know what my chances are of seeing the launch of a suborbital object when I did not know the launch details beforehand but instinctively I would say they are very slim: an extraordinary case of being in the right place at the right time! Karen and Mike are above me in Node3, and I dare to look away for a moment to call them. They both float into the Cupola and we share the little space to observe the object as it follows its path through the upper layers of the atmosphere. Its trail is now at the mercy of the stratospheric winds which distort the shape, transforming it into a series of segments that twist, starting from the ground till it reaches the blackness of the stellar vacuum. I take one of the cameras and hope that the automatic settings will be enough to take good pictures, despite the light from the sunset starting to fade. I stop shooting only when the Sun is completely gone, but I do not stop looking. The object disintegrates before our eyes, and hundreds, probably thousands of kilometres away, we see a cloud of transparent white gas expand growing ghost-like, in all directions until it flattens when it meets the atmosphere. We wonder what we just witnessed, but even Houston ground control fails to explain. In the evening, we discover that it was the test launch of a Russian intercontinental missile launched from Kazakhstan. All three of us are surprised by the incredible coincidence that allowed us to observe such a rare event. We are not sure what to think. For my part, I am pleased to add another valuable piece to the only true collection I have, the only one that is worth anything: my memories. E finalmente hai scritto un nuovo pezzo ! Una sola parola …. ANCORA ! Hai uno stile scorrevole e familiare, quasi liquido, che prende per mano il lettore e lo porta sull’uscio dell’ambiente che descrivi, e gli fa sentire i suoni, percepire le emozioni, scorgere i particolari nascosti, coinvolgendolo e stupendolo piacevolmente. Ancora …. vogliamo sentirti raccontare ancora. Non ci si improvvisa narratori, tu hai un dono, sviluppalo. Che dire, le foto sono incredibili. Qualsiasi fotografo “dilettante” ne sarebbe orgoglioso e sicuramente un po’ invidiato. Spesso il caso produce effetti sorprendenti, però la passione e la curiosità costante aiutano. Bravo. Devo ammettere che la mia prima reazione è stata di allarme. Ma come, un missile russo! Ma non sapevano che la ISS ci passava vicino? Pensi ancora che sia tutto sotto controllo? Lo spero tanto. Il cielo lassù diventa sempre più affollato, di oggetti e di rottami. Ho letto del progetto Loom di Google che vorrebbe lanciare centinaia di palloni stratosferici ad un’altezza di 18000 metri per consentire una copertura WiFi di zone difficilmente raggiungibili. Certo, la vostra quota è molto maggiore, ma come si farà a salire e scendere senza l’equivalente dei controllori del traffico aereo? Arrivederci. Sei un grande, grazie mille! Complimenti per come descrivi i tuoi giorni lassù. Un articolo senza una sbavatura, un racconto senza un minimo di accenno alla continua caccia alla supremazia militare ora da una parta ora dall’altra. Un racconto prezioso di una missione spaziale che al di la delle acquisizioni scientifiche, Luca Parmitano ci racconta giorno per giorno le meraviglie del nostro pianeta. Grazie. Ti invio un piccolo racconto. Mi piacerebbe che lo leggessi. Grazie per il tempo prezioso che perderai. Era da tempo, probabilmente dallo stesso giorno del suo insediamento, che volevo avere un incontro con Papa Francesco. Mi aveva colpito la scelta del nome “Francesco”. Il mio pensiero è corso subito al giorno dell’abdicazione di Benedetto XVI. Dissi fra me e me “mi piacerebbe che il prossimo Papa scegliesse il nome di Francesco”. Non potevo credere alle mie orecchie, il nuovo Papa si sarebbe chiamato Francesco e non Francesco I (come qualche ignorante giornalista disse a suo tempo) ma solamente Francesco in quanto prima di Lui nessun altro Papa aveva scelto questo nome. Avevo bisogno di partecipare questa mia personale premonizione a qualcuno ma pensavo che la gente avrebbe potuto dire: sì va bene ma era prevedibile. Sicché la tenni per me ma, segretamente, inviai un messaggio alla Santa Sede chiedendo una udienza privata con il Papa. Un’assurda fantasia che mi abbandonò dopo qualche settimana di silenzio del Vaticano. Figuriamoci un’udienza privata con il Papa. Ma chi ero io? La presunzione degli uomini spesso non ha freno ed io, come tutti gli uomini, avevo sperato per un momento di potere accedere alle divine stanze papali per un colloquio privato con Papa Francesco. Erano passati parecchi mesi dalla sua elezione. Le gesta del Papa viaggiavano da un capo all’altro del pianeta come se fossero la normalità di un uomo di chiesa. Non è così era il Papa che viaggiava, era un uomo sì, ma anche il capo spirituale della Chiesa di Cristo. Il successore di Pietro era andato a Lampedusa così come era andato in Brasile, un uomo capace, nelle sue benedizioni domenicali, di grandi ammonimenti ai potenti della terra e al tempo stesso inviare 200 euro ad un’anziana signora rapinata da uno scippatore. Un uomo che scendeva tra la folla per baciare i bambini, gli ammalati, per stringere la mano a quanti gliela tendevano, incurante della viltà di prezzolati sicari. Giovanni Paolo II era stato vittima, durante il suo papato, proprio di un sicario. Pensai a quanto ero stato ingenuo nel mio pensiero presuntuoso di potere incontrare Papa Francesco “Il Giusto”. Mi piaceva l’idea di avergli dato questo soprannome “Il Giusto”. Come tutti i grandi uomini Papa Francesco “il giusto” dorme poco, spesso come è noto si alza nel cuore della notte e tra il 13 e il 14 ottobre, forse una delle notti tra le più tormentate di questi ultimi mesi, si reca alla sua scrivania per lavorare e, nel cercare alcuni appunti di qualche tempo prima, nota una mail dimenticata. Era quella che gli avevo scritto nel mese di maggio di quest’anno. Durante la notte sento che il mio cellulare vibra ripetutamente, rispondo un po’ preoccupato: “pronto”, “sono il Papa” – risponde una voce dall’altro capo del telefono – “so che mi volevi parlare ma anch’io ho qualcosa da dirti, vieni che ne parliamo”. Mentre ancora mi domando se è uno scherzo o qualcos’altro, guardo l’orologio: sono le tre di notte, una macchina si ferma sotto casa pronta a trasferirmi all’aeroporto dove un aereo mi sta aspettando. Cinquanta minuti dopo sono a Roma. Papa Francesco “Il giusto” mi sta aspettando. Mi saluta stringendomi la mano e mi dice: “siediti all’altro capo del tavolo” (un tavolo rettangolare di colore noce non particolarmente lungo). Comincia dicendomi: “So che sei sposato. Perché non porti la vera?”. Gli rispondo senza indugio sostenendo che è un inutile orpello e lui aggiunge “Io porto la fede perché sono sposato con la Chiesa vuoi con questo dire che è inutile?”. Cerco di darmi un tono ma le domande che mi fa nel cuore della notte sono tante ed è difficile trovare una risposta a tutte. Mi sovviene, tra le tante risposte date anche quella dell’Arcangelo Michele che si presenta a San Francesco da Paola con uno scudo dicendogli “questo sarà lo stemma del tuo Ordine”. Mentre pronuncio questa frase entra nella stanza una suora la quale rivolta a Sua Sanità dice: “Santità è ora di andare a Santa Marta”. Il Papa esce facendomi un cenno di saluto con la mano. Non ricordo bene come sia ritornato a casa. Ma che ci volete fare, spesso, i sogni non hanno né inizio né fine. Innanzi tutto complimenti per le foto che mi lasciano sempre a bocca aperta tanto sono belle e incredibili. La tua maniera di scrivere sa di racconti fantastici che solo qualche anno fa si trovavano nei libri di fantascienza , ora nel 2013 li stiamo vivendo in diretta ed è realtà . Devo dire anche che la tecnologia usata in questi termini è una meraviglia. Ti ringrazio per tutto quello che ci fai condividere e la maniera con la quale ci proponi le tue esperienze. Sei motivo di orgoglio per tutti noi Italiani. Ps mia moglie è monegasca si vede quel piccolo paesello stato che è Monaco? Grazie delle tue condivisioni. Un abbraccio poco fluttuante da un tunnel della metro di Roma. Caro Luca, non ci conosciamo ma ho letto tutto comprendendo le tue emozioni, che sono diventate anche le mie. Così ogni giorno, cerco una tua foto, un tuo intervento sul social network, che testimonia la tua passione per ciò che stai facendo. Sarai parte di un equipaggio che farà storia, ne sono convinto. Grazie per quanto trasmetti e buon lavoro. Anche io aggiungerò un altro prezioso pezzo all’unica mia collezione: il ricordo di aver avuto l’onore di “parlare” con te. Ciao Luca, io ho guardato le tue foto ogni giorno da quando siete lassù, insieme a quelle di Karen ed ho sempre pensato un qualcosa che non mi sono mai permessa di scrivere !! Poi leggo qui quel qualcosa: confermo che le foto di Karen sono molto artistiche e riflettono e riportano una attenta sensibilità che Karen di certo ha. Che bello leggere questa tua sincerità. Ma tu che dici di non essere bravo con le fotografie, hai un qualcosa d’altro che è estremamente e ugualmente prezioso! Hai la stessa sensibilità di Karen, anche se Karen ci aggiunge un tocco femminile, e in aggiunta tu hai “un cuore italiano” come diceva Depardieu nella pubblicità. Detto così fa quasi sorridere, ma se si libera l’affermazione dall’ironia, dicendo così, si spiega tutto quel “tanto” che hai e che ci metti tu e tutto quel”tanto” in più lo dividi con noi quaggiù. In questo tu hai il primato, a livello mondiale, si potrebbe aggiungere. Le foto di quella settimana poi, sono mozzafiato! Talmente tanto che mi hanno fatto (quasi) dimenticare quelle di casa mia. So bene quanto quella dell’aurora sia stata cercata/voluta, in quanti te la chiedevano, e quanto avresti voluto accontentarci. E fu così che il premio, finalmente, arrivò: prima che per noi, per te. Un etereo spettacolo fissato, grazie a te, anche nella mia memoria, tra le altre migliaia di emozioni e di ricordi. Chiaro, non l’ho vista dal vivo. Ma che shock bellissimo trovarmi quella foto all’improvviso! Inaspettata, magica… non riuscire a trovare le parole per esprimere lo stupore… e la cosa più bella, l’unica certezza, è sapere che basterà riguardarla per riaccendere il cuore e rivivere tutto. E’ verissimo che ogni foto racconta una storia: dentro ognuna di esse ci sono delle persone, delle vite, dei momenti, che, per ovvi motivi, saranno irripetibili. E’ proprio per questo che uno scatto, due parole su un foglio, sono necessari per fissare, per bloccare l’attimo… per congelarlo prima che sfugga via. La memoria poi farà il resto. Anche la mia. E grazie perché dare voce, “fare parlare”, delle foto così belle non è facile. Tu ci riesci. grazie per aver risposto con un pezzo come sempre pieno di magia ed anche di informazioni alle domande che molti, fra cui anche io, avevamo fatto su queste foto della scia e della nuvola di gas conseguenti al lancio del missile. E se le tue “memorie” saranno ricche di tesori dopo questa tua esperienza orbitale, grazie a te lo saranno anche le nostre… Grazie e buon lavoro! Se Le emozioni nutrono l’anima, con te tutte le volte é un’abbuffata!!! Caro Luca, leggo sempre con emozione i tuoi scritti, perché trasmettono tutta la tua passione nella tua avventura spaziale e in qualche modo anche noi ci sentiamo partecipi. Quando alla sera vedo sorvolare nel cielo sopra di me l’ISS, mi sembra di potervi salutare tutti voi. avrei bisogno di comunicare con lei, è possibile? ti seguo non da tantissimo e non ho avuto ancora modo di sfogliare tutto il tuo “album fotografico” ma le foto che ho visto sono state sufficienti per darmi la sensazione di essere di fronte ad “un artista” e sottolineo artista, non intendo grande fotografo. Hai descritto molto bene ( del resto come non riconoscere le tue doti di scrittore! ) la tua esperienza con la macchina fotografica; tu non conosci le tecniche, sei impacciato con congegni troppo complicati ( lo dici tu, se non ho capito male, ma non ci credo!) eppure le tue foto sono un racconto … e secondo me sono anche di più perché stimolano l’emotività e la fantasia di ciascuno di noi che cerca di scoprire la tua storia ma ne racconta anche una propria fatta di percezioni, pensieri ragionati o immediati ed è sorprendente e magico leggere le storie di tutti… mi piacerebbe poter dedicare più tempo anche ai diversi commenti su fb ma non ne ho a sufficienza per tutti! Tu “senti il silenzio del mondo” dallo spazio e ce lo racconti e noi quaggiù spostiamo il senso del tuo racconto nella direzione che vogliamo… io non sono una critica d’arte ma secondo me le tue foto sono artistiche perché stimolano in noi emozioni, le stesse che proveremmo di fronte ad un quadro di un pittore impressionista o surrealista. Raccogli le tue foto con la tua presentazione e aggiungi per ognuna di esse qualche commento che ti ha particolarmente impressionato … Ne farai un’opera d’arte “futurista partecipata” candidata al Premio Nobel dell’arte … secondo me, naturalmente, me che non sono “nessuno”! Complimenti “grande uomo” e grazie! you’ve never been a good photographer? who knew there was a contest? i remember seeing your first image you shared from the i.s.s. it was a grand image of the earth where one can see the curved horizon, and no real discernible landmark features. this was far different than what col.chris hadfield had shared… col. chris hadfield loved to share earth images using the powerful telephoto lenses where he would capture close-up images of unusual landmarks… both your images as well as col. chris hadfields images have merit! in regards to the missile trail photo, and the disintegrating gas cloud from the exploded missile, i wonder if there is more than one image of each of these artifacts? i imagine there are a few organizations that wish that the missile and explosion wasn’t public information, however, i believe we all gain and benefit from the knowledge and images of what was observed… — the reason i ask if there is more than one image, is because i am a fan of 3D stereo photography. it’s likely an unrealistic expectation, however, i had been attempting to encourage col. chris hadfield and maybe a couple of others to capture more than one image of the same subject to hopefully capture 3D stereo images. this would certainly consume a lot of space in the memory cards, however, for a few items, the end result may very well be worth it… over the next ten to twenty years, we will likley see more and more 3D computer monitors and video screens. now would be an excellent time to start looking towards the future in viewing 3D images and video, and capturing images in 3D stereo, although the current technology may be somewhat limited… i think noctilucent clouds, and the aurora would be spectacular candidates for 3D stereo photographs from the i.s.s. one may also view a few of my other albums of 3D stereo images, most of which are multiple equilaterally linear offset exposures taken by a single camera phone. you mentioned, “Some may remember the ending of a famous song from many years ago that repeated insistently that every picture tells a story.” – i am curious as to what this song is??? Sei mai stato un buon fotografo? Chi sapeva che c’era un concorso? ricordo di aver visto la tua prima immagine che hai condiviso dall’i.s.s. era che una grande immagine della terra dove si può vedere l’orizzonte curvo e caratteristiche non discernibile reale punto di riferimento. Questo era molto diverso rispetto a quello che col.chris hadfield aveva condiviso… il colonnello chris hadfield amava condividere immagini utilizzando i teleobiettivi potenti dove egli avrebbe catturare immagini ravvicinate dei punti di riferimento inusuali… le immagini come pure col immagini di chris hadfields hanno il merito di terra! 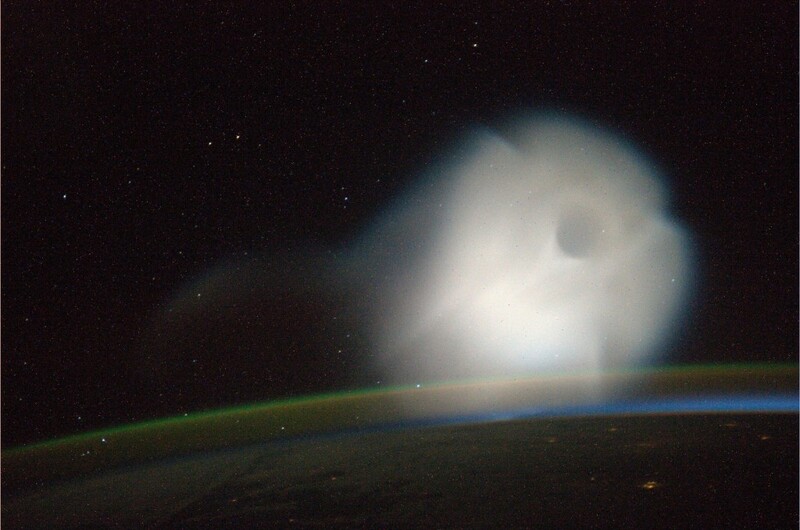 per quanto riguarda la foto del sentiero di missile e la nube di gas disintegrando da missile esploso, mi chiedo se c’è più di una immagine di ciascuno di questi manufatti? Immagino che ci sono alcune organizzazioni che desiderano che il missile e l’esplosione non era pubbliche informazioni, tuttavia, credo che siamo tutti guadagnare e beneficiare le conoscenze e le immagini di ciò che è stato osservato…..–il motivo che mi chiedo se c’è più di un’immagine, è perché io sono un fan della fotografia stereo 3D. è probabile che un’aspettativa irrealistica, tuttavia, avevo tentato di incoraggiare col chris hadfield e forse un paio di altri per catturare più immagini dello stesso soggetto a speriamo che cattura immagini stereo 3D. certamente questo consumerebbe un sacco di spazio in schede di memoria, tuttavia, per alcuni articoli, il risultato finale potrebbe essere degno esso… nei prossimi dieci a venti anni, ci sarà likley vedere più e più 3D monitor di computer e schermi video. ora sarebbe un ottimo momento per iniziare a guardare verso il futuro nella visualizzazione di immagini 3D e video, catturare immagini in 3D stereo, anche se l’attuale tecnologia può essere un po ‘ limitata… penso che nubi nottilucenti e aurora sarebbe spettacolari candidati per fotografie stereo 3D dall’i.s.s. uno può anche visualizzare alcuni dei miei altri album di immagini stereo 3D, la maggior parte delle quali sono esposizioni offset equilaterally lineari multiple prese da un singolo telefonino. Lei ha citato, “Alcuni ricorderanno il finale di una canzone famosa da molti anni fa che ripete insistentemente che ogni immagine racconta una storia.” – io sono curioso di sapere che cosa è questa canzone??? che meraviglia i tuoi post! Una volta lessi che lo scopo di ogni fotografo è arrestare il movimento, che è vita, con mezzi artificiali e tenerlo fermo in modo che cent’anni dopo, quando un estraneo lo guarderà, torni a muoversi, perché è vita. Mi piace pensare questo anche delle tue foto. C’è cuore pulsante, anche quando fotografi un deserto e questo perchè nelle tu metti sulla stessa linea di mira la testa, l’occhio e… il cuore. Non c’è solo profondita di campo nelle tue foto, ma profondità di sentimento ed è per questo che la foto dell’ Aurora ha entusiasmato e galvanizzato tutti. Ci rendi la vita più bella, Luca. natura, artificialità, magia, emozione, umanità! c’è tutto in questo tuo post, e forse anche di più!!! Ci siamo emozionati noi, qui da dietro un monitor, nel veder le foto di questi giorni, figuriamoci chi le immagini le ha memorizzate nell’hard-disk umano! Every Picture Telles a Story!!! E’ vero, ogni immagine racconta una storia, e non occorre essere maghi della tecnologia fotografica; le foto raccontano ed immortalano ciò che l’autore vede, nel modo in cui lo vede lui, e poi trasuda sempre la personalità dell’autore degli scatti; ed anche qui, durante il tuo viaggio reale-fantastico (fantastico perchè anche tutti noi qui da terra viviamo fantasticando la tua avventura, che ormai è anche nostra), da ogni tua foto si percepisce l’umanità dell’autore. Aspettiamo con ansie altre foto e quindi altre emozioni. Ciao Luca, complimenti e continua così! capisco che la realtà che si vede da lassù è talmente bella che qualsiasi dilettante saprebbe essere un bravo fotografo… ma la tua semplicità nell’esprimere le tue emozioni e nel raccontare attraverso gli scatti con cui ci delizi + davvero spiazzante… hai un modo così diretto e tranquillo che leggerti è un vero piacere… grazie per tutto quello che fai per noi … torna presto… il mio sogno un giorno sarà quello di poterti conoscere e stringerti la mano per complimentarmi dal vivo… grazie grazie grazie!!! Ciao Luca, le tue parole hanno un solo e grande effetto su tutti noi che le leggiamo…. EMOZIONI… esprimono una sensibilità che… sembra di essere li con te! Va bhe posso andare a dormire e sognare di volere un’altra vita.. per diventare.. astronauta! Grazie per questa incredibile sensibilità e per le tue poetiche immagini. Le tue memorie, i tuoi racconti visivi e scritti non fanno compagnia solo a te, ma anche a tanti tanti qui a Terra… Ti ho scoperto da poco su facebook e ora qui… e ti seguirò. Grazie ancora. Hi Luca, My mum would have loved to been able speak to a man in space. I love the photo’s that you take, you do take great pictures. Your job is a very interesting one. I love reading you posts Luca. Have a good day mate. Grazie Luca, per voler condividere tutto ciò che i tuoi occhi vedono e vedranno.. I tuoi racconti sono meglio delle fiabe della buona notte.. Ogni foto racconta una storia.. e si sa che la storia è infinita.. per quanto possiamo saperne.. 😉 Grazie ancora..sono veramente immagini splendide e uniche e il tuo modo di raccontare è quello di un narratore nato..